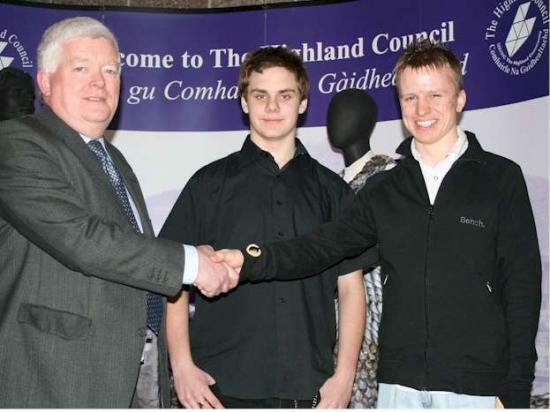 The two new leaders of Highland Youth Voice, the young people's parliament for the Highlands, were introduced at the meeting of The Highland Council's Education, Culture and Sport Committee held on Thursday 15th January 2009. Robin Falconer from Wick is the new Chair of Highland Youth Voice and Lewis Munro from Plockton is the new Vice Chair. They were elected by the Highland Youth Parliament's Executive Committee members to provide leadership over the next year. Robin (17) attends Wick High School and has been a member of Highland Youth Voice for three years. He will be leading the youth parliament and representing other young people across Highland, feeding back the views of young people when appropriate to Highland Council services and other public organisations such as NHS Highland, Police and Fire services and voluntary agencies. Lewis (17) attends Plockton High School and has also been involved with Highland Youth Voice for three years. He will also help lead the work of Highland Youth Voice. Both Lewis and Robin are also active in their local areas - Robin has helped to set up a youth caf� and is involved with the Caithness Youthbank, and Lewis has been helping run his local youth club for the last 3 years. They will be organising and presenting at the annual Highland Youth Voice conferences where young people from Highland discuss important issues for young people in the Highlands. The next conference is in Sabhal Mor Ostaig on Skye, 1-3 July 2009. They will also lead the Highland Youth Voice's Xec (the Parliament's Executive Committee) who meet regularly in Inverness and Aviemore to help run the business of the Youth Parliament. Councillor Bill Fernie, Chairman of the Education Culture and Sport Committee, said 'I'm sure they will be a great help to Highland Youth Voice and young people in the Highland area in their new roles. Congratulations go to both of them. They have worked so hard with Highland Youth Voice already and I look forward to working with them in what looks like a busy and exciting year ahead!"